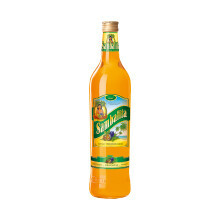 Sambalita is a fruity fresh liqueur that is an exotic pleasure with the flavour of sun-ripened passion fruit. The cult liqueur has enjoyed great popularity since the 80s. Moreover, Sambalita is surely the only liqueur that once made such great headlines with its packaging, because in the GDR (German Democratic Republic) times a “bare-breasted beauty” adorned the front label of Sambalita. Later the design was completely revised, due to results of market research in the core sales area, innuendos were not welcome. After Sambalita was on the market in a revised design for a few years, in 2013 the cult liqueur changed again to a retro look. The design from the beginnings of the brand were picked up and slightly modified: the “beauty” is back, but with a minor difference – now she is no longer bare-breasted! Sambalita is back in the hearts of the fan base, not at least due to this design and the comeback of the “beauty”! Back then as well as today, Sambalita is created with special care in the tradition-steeped Wilthener brandy distillery. Balanced with the flavour of sun-ripened passion fruit, Sambalita retains its special fruity note and is therefore ideal for any social gathering. 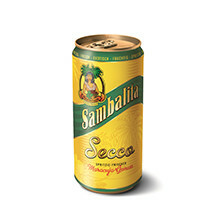 Pure, on ice, as a cocktail or mixed with sparkling wine – Sambalita provides various opportunities for pleasure.